Elegant curves and a stainless-steel body encase the slim, mobile phone-sized IXUS 300 HS. There is no viewfinder, but the 3in, 230,000-dot, 16:9 aspect ratio LCD screen has a wide viewing angle both horizontally and vertically, and can be seen reasonably well in sunlight. The widescreen format is perhaps an indication that HD video will become an increasingly prominent feature in future compact camera releases. I was concerned that I might crack the screen when the camera was in my pocket, but it survived when treated with care. 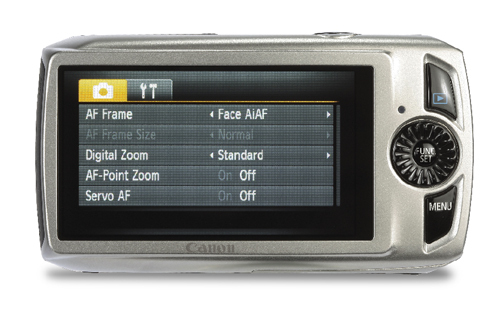 There are many features consistent with recent releases in the IXUS range (see the IXUS 210 test), such as smile- and blink-recognition shooting modes. These work particularly well when shooting children or when using the self-timer. The menu is simple to navigate with the responsive scroll wheel, which enables button provision to be kept to a minimum. Enthusiasts will appreciate the aperture and shutter priority modes, but there is no fully manual setting.